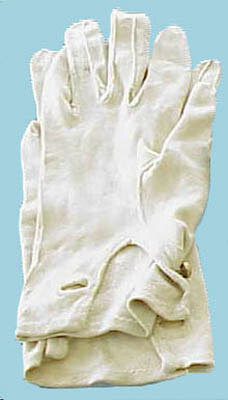 In the Nineteenth Century white gloves were emblematic of a gentlemen. It was unthinkable for an officer to appear in dress without them. The pair illustrated above are made of chamois leather and button with a gilt button. They belonged to Colonel Joshua A. Varian of the 8th New York Militia Regiment. Most gloves worn by officers are indistinguishable from civilian ones. As time passed gloves became less fashionable but are still worn today during formal ceremonies, such as military funerals. Gloves were also worn by enlisted men. General Sherman's Army commenced to march by this station early this morning. His troops are on the way from North Carolina to Washington. They look tough and hearty but without much style. My men have new uniforms and white gloves, and my camp was overrun with Sherman's men who thought we were green troops and undertook to help themselves. --Diary of Elish Hunt Rhodes, 2nd Rhode Island Infantry.